Hidden hinges are an excellent choice of hinge for a number of reasons. Firstly, their absence from view is aesthetically appealing, as it creates a cleaner, less cluttered look. Secondly, hidden hinges do not catch as much dirt and grime as exterior hinges do, which can be difficult and tedious to remove, and what dust they do collect is hidden from the eye. This is especially advantageous for a space in which cleanliness is of special importance. Hidden hinges are also very easy to adjust. Furthermore, since they are on the inside, they do not leave behind an immediate scar when adjusted or moved. Some hinges are actually designed to adjust in situ, thus allowing people to leave the hinge in its original position while they make small adjustments. Some manufacturers have solved the same problem with the opposite approach by designing hidden hinges as clip-ons, which allow people to completely remove the component to adjust it. It is important to make sure that all components fit well into the original design, so hidden hinges are best selected early in the process of constructing your product. Even the most diligent builder often needs to make adjustments, and hinge adjustments are much easier to complete before a piece is fully built. To build a high quality product or to replace a hinge, a person must also consider the material or finish of the hinge he or she purchases. Hidden hinges can be ordered directly through a manufacturer, and some companies will even honor requests for custom-made hinges, allowing for special order materials and finishes. In order for your product to serve its purpose well and live a long life, hidden hinges must occasionally be serviced. For a hinge that has become stiff or creaky, a simple wipe-down and application of oil will do the trick. This will keep help keep the hinge from corrosion, as well as make its movement smoother and more even. Hidden Hinges A hidden hinge is, as its name suggests, a hinge that is designed to function while being hidden from view. 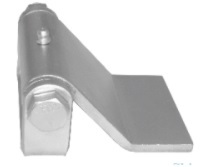 These hinges are capable of being installed so that no part of the hinge is visible from the outside when the objects to which they are attached are in use. Hidden hinges are also referred to as concealed hinges, invisible hinges and, sometimes, European cup hinges.